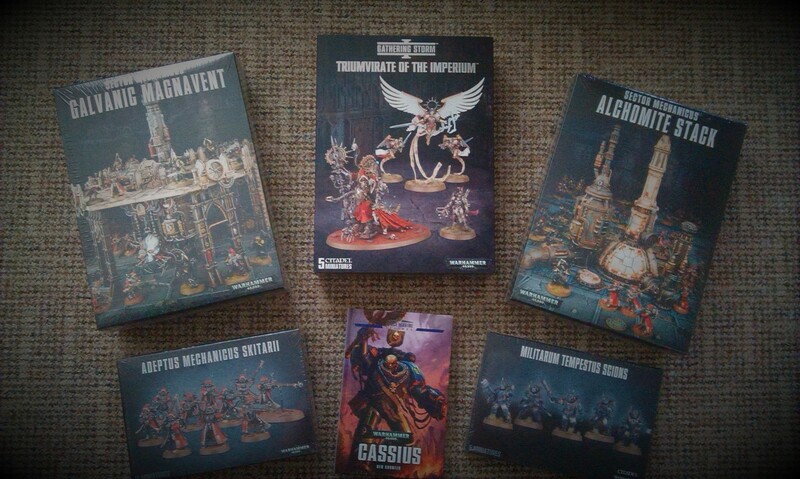 By now, you no doubt realise that I have an addiction to Games Workshop and their little plastic men. Well, we all have our vices. Anyway, while I’ve been both adding to my Necrons, and building up my Dark Eldar, I’ve also been thinking about a lot of the smaller-scale stuff that I have had on the go for varying lengths of time. Genestealer Cults, Deathwatch, and even the regular Space Marine stuff – but first and foremost, I’ve been thinking about making some sort of expansive Imperium army. With the release of the Imperial Agents codex last Christmas, I’ve been pondering all sorts of different combinations of interesting little marginal character-armies, and with the roll-out of 8th Edition, this idea is getting a little more firmly off the ground! 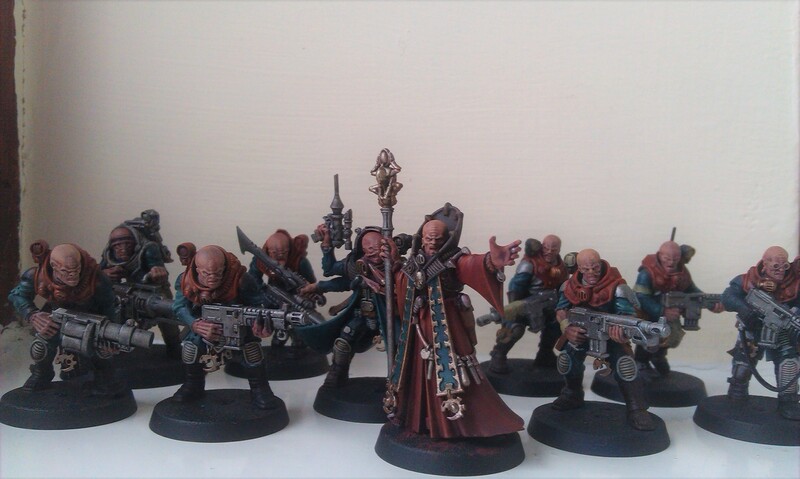 Back in May, I’d picked up a Start Collecting Skitarii box set, and not long after had built up five Skitarii Rangers. They’d been hanging about primed for a number of weeks, but finally I’ve decided to actually get myself in gear and paint the little blighters! I’d initially wanted to paint them in the Metalica scheme, but decided that I didn’t want the hassle of painting the off-white robes. In the event, I’ve created my own Forge World, which is yet to receive a name, but still! 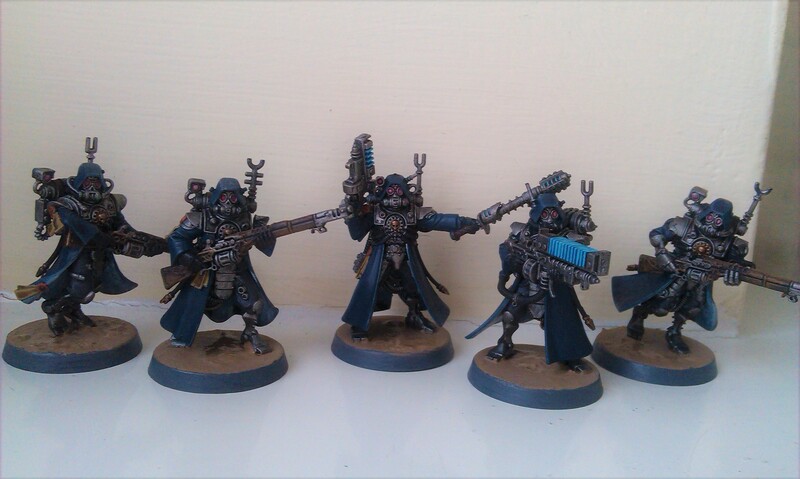 I’d initially wanted to have some very blue Skitarii, to contrast with the usual reds, but as it turns out, these chaps are just kinda muted and grungy. I’d hoped the bases would brighten the scheme somewhat and set them off nicely, but as it happens, they just seem to have added to the overall muted effect! Hm. The robes have been done with Stegadon Scale Green, with Dark Reaper and Thunderhawk Blue providing the highlights; inside it’s a case of Celestra Grey and Ulthuan Grey, all of the robes then shaded with Drakenhof Nightshade. The pressure suit was done with Eshin Grey shaded with Nuln Oil, and the metallics are the usual scheme of Leadbelcher and Nuln Oil, and Balthasar Gold and Agrax Earthshade. I’d decided against painting the Machina Opus in the usual half-and-half manner, and instead have opted for a golden skull. Might see if I can somehow tie that in to the history of my Forge World at some point. The guns are painted with Rhinox Hide, shaded with Agrax Earthshade, and then highlighted with Skrag Brown. The Arc weaponry is Caledor Sky highlighted with Baharroth Blue. Both of these are pretty much the Duncan-approved methods, anyway! The purity seals are Zandri Dust (parchment) and Tuskgor Fur (wax) shaded with Agrax Earthshade. Finally, the eye lenses have been done with Ulthuan Grey shaded with Carroburg Crimson. Despite the fact that they haven’t turned out as I’d first imagined them, I nevertheless actually really like these guys! I think once I have a proper horde of them on the tabletop, with some vehicles in amongst them, it’ll look really cool, anyway! So what am I going to be doing with this army? As I said before, it’s an Imperium Army, and for the most part I’ll be using models that I’ve already got hanging about for one reason or another. It’s broken up into two Patrol detachments, and combined comes to 50 power / 1000 points exactly. Let’s break it down. I’ve got a lot of Militarum Tempestus stormtroopers anyway, so thought it would be good to get some use out of them. Two squads of five Scions, flying about the field in a Chimera with a Commissar for inspiration should be useful – by giving every squad a vox caster, I should be able to make maximum use of the Tempestor Prime and his command rod, relaying orders up to 18″ away from him. I mean, in my head it sounds cool, but I don’t know exactly whether it will play out that way! I bought a bunch of Astra Militarum stuff around Christmastime for my burgeoning Genestealer Cults army, so already have a Chimera and Commissar that are just waiting to be built – I had initially thought about converting the Commissar to be a Genestealer Hybrid, as I wanted my entire Guard to be cultists, but I think that may be a bit too much to bother with. Plus, the Primus is a pretty good Commissar stand-in if I need one! I’ve already built up two squads from a pair of Scions kits, as I was building up the relevant Scions for the expansion to Deathwatch Overkill that appeared in White Dwarf back in the day. Working through each of those models has proven to require a third box, however, to make legal squads, but no matter. I enjoy having the variety of weapons and such, anyway, and they are really quite wonderful kits to put together, after all. For the Skitarii portion of the army, I only needed to get a second squad of the Rangers/Vanguard kit, and a Sydonian Dragoon. I’d already been attempting to paint some Electro-Priests over a year ago now, so hopefully this will prompt me to finish them off, and the Start Collecting box really is incredible value. I do plan on getting another in time, in part to continue the idea of a wave of Skitarii marching implacably across the table, but those Onager Dunecrawlers have been growing on me as models, and while I’d initially planned on selling that portion of the box, I think I’d like to have at least a pair of the buggers on the table! 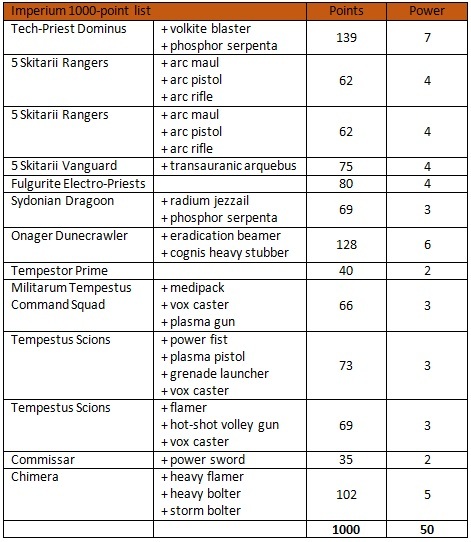 The Skitarii portion of the list feels much smaller, but is actually a fairly significant portion of the overall army. While I was surprised at first at how cheap some of the units actually are, I think it would also be quite easy to sink a lot of points into upgrades that, on T3 models, are probably wasted. If building Dark Eldar has taught me anything, it’s to be sparing with the upgrades!! Before I end this blog, I just want to give a shout-out to Alchemists Workshops in Winsford, who I came across after watching The War Gamer‘s painting tutorials on youtube. I trundled over there earlier in the week to pick up the above bits, and couldn’t believe how well-stocked and how cheap the Games Workshop stuff is! It’s in the middle of an industrial estate, which feels a little weird to me, but I was very impressed! Definitely going to be making that journey again to stock up on stuff soon, anyway! Previous Previous post: Let the campaign commence!